In a world that must reduce its dependency on fossil fuels, replacing oil subsidies with renewable energy subsidies makes sense. Although this is undeniably difficult, it would produce both environmental and economic benefits. Putting an end to oil subsidies would free public money that could be used to promote clean energy and make renewables more competitive. Although renewable energy is destined to increase it will not grow fast enough to stabilize GHG concentrations below 450ppm which will result in a temperature increase of more than 2°C. According to the International Energy Agency (IEA), global demand for renewables currently account for approximately 4 percent of total energy. Demand for renewables is expected to rise to 14 percent by 2035, while fossil fuels, which now have 75 percent of global energy demand, will decline to 62 percent over the same period. The case against the fossil-fuel subsidies is overwhelming. They encourage inefficient energy use and they represent a huge amount of lost revenue. Sheltering consumers from oil’s price volatility also shields them from incentives to pursue renewables. Oil subsidies are actually increasing the consumption of fossil fuels. Fatih Birol, the chief economist at the IEA, points out that 95 percent of current growth in oil demand is coming from countries where the oil price is subject to subsidies. The IEA estimates that removing fossil-fuel consumption subsidies would reduce global carbon-dioxide emissions by 1.5 to 2 billion tons by 2020. The IEA’s World Energy Outlook report indicates that eliminating subsidies by 2020 would cut global energy demand by 3.9 percent or the equivalent of 600 million tons of oil. The abolition of these subsidies would reduce demand by almost 5 percent by 2035. An analysis made by the Organization for Economic Cooperation and Development (OECD) and the IEA illustrates that removing fossil fuel subsidies in a number of non-OECD countries could reduce world Greenhouse Gas (GHG) emissions by 10 percent in 2050. Removing these subsidies would amount to roughly a seventh of the effort needed to keep temperature increases below 2°C. Fossil fuel subsidies are difficult to estimate because they are complex and take many forms. 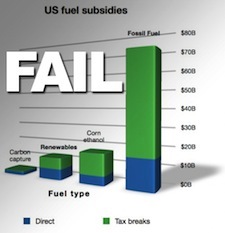 In its simplest essence, these subsidies refer to any government action that lowers the cost of fossil fuels. This includes everything from tax breaks, to preferred rate loans, price controls and purchase requirements. A report from the OECD estimates that between $45 billion and $75 billion in budgetary support and tax expenditures have been provided to the coal, oil and gas industries by the 24 richest OECD countries. According to the IEA, consumption subsidies in 37 developing countries were worth $557 billion annually. The IEA data indicates the worldwide cost of fuel subsidies for oil amounted to about $190 billion in 2010, up from around $120 billion in 2009. According to the agency, expenditure on all fossil fuel (oil, coal and gas) subsidies could rise to $660 billion in 2020, up from $409 billion in 2010. U.S. federal subsidies to the domestic oil and gas industry, excluding coal, may be as high as $41 billion annually. When all forms of subsidies are tallied, including production subsidies and consumption subsidies, that total may be closer to $600 billion annually. A November 11, 2011 Bloomberg article reports that while governments are increasingly subsidizing oil and gas they are not making similar investments in renewable energy. According to the chief adviser to oil-importing, fossil-fuel consumers worldwide received about six times more government subsidies than were given to the renewable-energy industry. In its World Energy Outlook, the IEA said State spending to cut retail prices of gasoline, coal and natural gas rose 36 percent to $409 billion as global energy costs increased, while aid for biofuels, wind power and solar energy, rose only 10 percent to $66 billion. At the current rate, the IEA predicted that onshore wind generators will not be be competitive until 2020 in Europe and 2030 in China. In the U.S., wind turbines will not be competitive until at least 2035. The IEA data supports the idea that for renewable energy to be competitive with fossil fuels, they need more short-term subsidies. Despite disproportionate support for fossil fuels, a November 25, 2011 Bloomberg article reveals that in terms of new power-plant investments, renewable energy is surpassing fossil fuels for the first time. Electricity generated by wind, sun, waves and biomass drew $187 billion last year, compared with $157 billion for natural gas, oil and coal. Last year was also the first time expenditure in developing countries exceeded that of the industrialized world. We are witnessing a promising trend in wind and solar power. According to GWEC estimates, there were 36 gigawatts of installed wind capacity in 2010, 43 gigawatts of generating capacity in 2011, and 48 gigawatts are anticipated in 2012. New Energy Finance said there were 18.2 gigawatts of solar installations in 2010, 26.4 gigawatts in 2011, and 27.8 gigawatts are forecast for 2012. They estimate that investment in renewable energy may double to $395 billion a year by 2020. Despite their growth, renewable energy companies are struggling with oversupply issues and the austerity of the current business environment. The surge in production to meet growing demand has driven down prices and created an overcapacity. This has forced renewable energy companies to cut their margins and reduce their sales forecasts in 2012. The ongoing financial crisis has also hit renewable energy companies hard, making it even more difficult to develop new projects. Austerity measures are cutting spending on climate protection measures, including renewable energy subsidies, tax credits, and pollution abatement programs. In the U.S., the Department of the Treasury’s Section 1603 cash grants program for clean energy projects expired in 2011, while tens of billions of dollars continues to go to the American oil industry in annual subsidies. The sheer number of oil subsidies makes eradicating them a very complex problem. The IEA and the OECD indicate that there are at least 250 different kinds of subsidies for the fossil fuel industry. Perhaps the most difficult problem concerns the fact that ending subsidies for oil and gas is a political minefield. Despite these difficulties, the world is moving towards renewables driven by the inescapable logic of clean energy. However, this shift could be significantly expedited if we eliminated fossil fuel subsidies and increased subsidies for renewable energy.